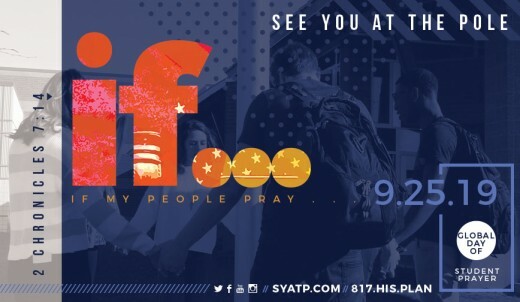 SYATP™ 2019 is Wednesday, September 25th! DAY: SEE YOU AT THE POLE day is on Wednesday, September 25, at 7:00 a.m. local time. All around the globe, in every time zone, students will be gathering at their flagpoles, praying for their school, friends, families, churches, and communities. SEE YOU AT THE POLE is a day committed to global unity in Christ and prayer for your generation. WEEK: The GLOBAL WEEK OF STUDENT PRAYER (Sunday, September 22 through Saturday, September 28) encourages students to find new and unique ways, places, and times to pray throughout the week. Whether you attend PUBLIC SCHOOL, PRIVATE SCHOOL, or HOME SCHOOL, gather your friends wherever and whenever and pray! The GLOBAL WEEK OF STUDENT PRAYER is dedicated to prayer and launching your on-campus Bible clubs, prayer strategies, and student ministries. 2019 SYATP Resources are in production. Please check back for more information. You can freely gather for prayer before school, but it's best to let your school administration know about See You at the Pole™. See You at the Pole™ is a student-led event. That means you! Strong student leadership is crucial to the success of your event. Your youth pastor can support you, your parents can pray for you, but you need to take charge and take part in See You at the Pole™. Use the questions below to help you plan See You at the Pole™ at your school. Make sure someone is covering every area of planning and leadership. Download an Adobe PDF version of the complete Checklist. Have you informed your principal about See You at the Pole™? What time will you begin on your campus—the publicized time of 7 a.m. or another time? Where will you gather on your campus? Flagpole or another place? Do you have an alternative meeting place in case of weather issues? Do you have more than one flagpole to choose from? Have you informed the FCA and/or other Christian organizations on your campus? How can you encourage other students to promote See You at the Pole™? The best way to promote See You at the Pole™ is to tell people about it. The strongest way to promote is a personal invitation. Make a list of friends to personally invite. Text them about any pre-pole or post-pole events, as well as to remind them to be there the morning of See You at the Pole™. Put up posters at church and at school. Get free publicity and clip-art for creating materials. Posters and other resources are also available to purchase on this site. Don’t cover the campus with flyers or stuff lockers—this may not be cool with the administration and is outside your rights as a student. Be sure you pick up any promotional material that might have been trashed or vandalized. Use these images on your Facebook, IM, Twitter, or web site. Show the See You at the Pole™ promo videos anywhere you can. It is great to use at rallies, Bible studies, worship services, or other Christian gatherings. The video is professionally produced, motivating, and has lots of options to show in different settings. Visit our YouTube Channel to see a few of the videos featured on the DVD. Be sure your youth pastor knows about See You at the Pole™. Tell him/her about your intentions and how he/she might support you. The See You at the Pole™ Church Bulletin Insert is a great resource for your church—or create your own insert. Encourage other students to wear See You at the Pole™ t-shirts to promote the event and on the day of See You at the Pole™. A great idea is to wear them on Wednesdays leading up the morning of See You at the Pole™. Have See You at the Pole™ announcements made at youth functions and special events. Publicly praying for See You at the Pole™ will help remind everyone of the day and the purpose. You may purchase See You at the Pole™ promotional resources—such as videos, brochures, posters, banners, wristbands and more—at reasonable prices. Visit our Online Store 24-hours a day or call (817) HIS-PLAN (447-7526) between 9a & 5p (Central), Monday through Friday. Someone needs to plan your school’s See You at the Pole™ event. Having a pre-pole planning meeting is a great way to get everyone together to talk about what you will do during See You at the Pole™. Many groups sing worship songs, read Scripture, and give testimonies while forming a large circle, then break into small groups of three to five students to pray. Remember—the focus of See You at the Pole™ is to pray! No matter what you plan, commit the most time to prayer. Use it as a final planning event before See You at the Pole™. A pre-pole rally is a great time for you to meet with other students from your campus to pray for the event and to go over the pre-pole checklist. This will help you make final preparations for See You at the Pole™. Hold the rally sometime close to the event. Some groups have found the Sunday night before See You at the Pole™ to be a convenient and effective time to hold a rally. Things you may include: testimonies from previous See You at the Pole™ events, See You at the Pole™ promo DVD, speakers, worship band, etc. If your rally will have students from only one school, then as a large group, have a student leader walk through the plans for the morning of See You at the Pole™ and delegate any needed responsibilities. This time is to be certain all the bases are covered and everyone knows what to do on the morning of See You at the Pole™. Download an Adobe PDF version of the Planning Sheet to help you plan what will happen during your See You at the Pole™ gathering. If your rally represents two or more schools, then break up into groups per school. Have each group go over all the details of See You at the Pole™ and make sure all bases are covered and everyone knows what to do. Taking care of this important detail will insure you have a smooth and awesome time on the morning of See You at the Pole™. How will you handle distractions such as traffic noise, onlookers, etc.? How will you begin the event? Who will lead off? Will there be other elements, such as singing or reading Scripture? Will you hold hands, kneel, break into small groups, or remain in a large group, etc.? Will students pray out loud or will there be silent prayer? How will you know when See You at the Pole™ is over? Will you stand up and pray, even if no one else will? While there is no requirement to ask the administration or school board's permission to meet, it is wise and courteous to inform the administration about See You at the Pole™. According to your constitutional rights upheld by Supreme Court precedent, you already have permission to have See You at the Pole™ because it is student-led, before school hours, and outside of any school building. It does not cost the district anything financially for students to meet and pray, so you aren’t “establishing religion with tax money.” Read the United States Department of Education's statement on Religious Expression in Public Schools. Know your rights. Students who take leadership should be willing to back up their beliefs, if necessary, by studying the materials available. Visit the Alliance Defending Freedom web site for more info regarding students’ legal rights. Plan your response. If ordered by a school official to disperse during See You at the Pole™, you should respectfully leave the school grounds and pray off campus. The goal of See You at the Pole™ is to pray to God, not fight with man. You can make an appointment with the official later to discuss the situation. Use your available resources. Expert legal counsel is available from several groups offering free assistance to individuals in religious-liberty cases. Timely intervention has resolved almost every situation with little difficulty! Remember—above all, you are representing Christ. A small group of teenagers in Burleson, Texas, came together for a DiscipleNow weekend in early 1990. They came seeking God and little did they know how powerfully He was about to move. On Saturday night their hearts were penetrated like never before, when they became broken before God and burdened for their friends. Compelled to pray, they drove to three different schools that night. Not knowing exactly what to do, they went to the school flagpoles and prayed for their friends, schools, and leaders. Those students had no idea how God would use their obedience. God used what He did among those teenagers and others who were holding similar prayer meetings at their schools to birth a vision in the hearts of youth leaders across Texas. The vision was that students throughout Texas would follow these examples and meet at their school flagpoles to pray simultaneously. The challenge was namedSee You at the Pole™ at a brainstorming session during a meeting of key youth leaders. The vision was shared with 20,000 students in June 1990 at Reunion Arena in Dallas, Texas. Only God had envisioned how many students would step up to the challenge. At 7:00 a.m. on September 12, 1990, more than 45,000 teenagers met at school flagpoles in four different states to pray before the start of school. Reports came into toll-free number for days after the first event. A few months later, a group of youth ministers from all over the country gathered together for a national conference in Colorado. Many of them reported that their students had heard about the prayer movement in Texas and were equally burdened for their schools. No other events had been planned, but it was clear that students across the country would be creating their own national day of student prayer. There was no stopping them. On September 11, 1991, at 7:00 a.m., an estimated one million students gathered at school flagpoles all over the country. From Boston, Massachusetts, to Los Angeles, California, from North Dakota to the tip of Texas, students came together to pray. Some sang, some read Scripture, but most importantly, they prayed. Like those first students, they prayed for their schools, for their friends, for their leaders, and for their country. As in all great movements of prayer, See You at the Pole™ did not begin in the hearts of people. It began in the heart of God. God used the obedience of a small group of teenagers to ignite what has become an international movement of prayer among young people. Since 1991, See You at the Pole™ has grown to God-sized proportions. Within the first few years, the movement began to spread to other nations through missionaries from the U.S. Now each year, an estimated 1 million students from all the world participate in See You at the Pole™. Students in more than 64 countries have participated. In places like Canada, Korea, Japan, Turkey, and the Ivory Coast, students are responding to God and taking seriously the challenge to pray. God is continuing to call His people to repentance and prayer. Countless inspiring testimonies of how He has used See You at the Pole™ to bring students to Christ and to change lives affirm God’s power to answer those who cry out to Him in humble dependence. Bible clubs, weekly prayer meetings, and other ministries have begun on campuses where students participated in See You at the Pole™. Download the history of See You at the Pole™. To Place an Order: (817) HIS-PLAN (447-7526) between 9a & 5p (Central), Monday through Friday or visit our online store 24-hours a day (once resources are available). For Questions with a Previously Placed Order: (817) HIS-PLAN (447-7526) between 9a & 5p (Central), Monday through Friday, or use the contact form below. Becky Tirabassi, Change Your Life Inc.
Catholic Diocese of Peoria, Ill.
Dare 2 Share Ministries Int’l, Inc.
First Priority of America, Inc.
National Council on Bible Curriculum in Public Schools, Inc.
your students and their friends to take part in See You at the Pole™. the other students in your community (or church) to take part in See You at the Pole™. your youth pastor/leader in your church as he/she motivates and guides students for See You at the Pole™. your students' parents to be supportive of their involvement in See You at the Pole™. the non-Christian students that could be reached through See You at the Pole™. the Christian students in your community to strengthen their unity on campus all year long. The best place for an adult to pray on the day of See You at the Pole™ is not on campus with the students, but at alternate locations such as your church, home, courthouse flagpole, office building flagpole, or military base flagpole. It is important for students to know they are supported by adults from their churches, communities, and schools. Only upon an invitation from a student leader, an adult can serve at local campuses by assisting with any needs they have prior to or after See You at the Pole™, or possibly recording video or taking pictures during See You at the Pole™. Consider encouraging your students to start a Christian Club or other student-led group at their school. Christian Clubs can be recognized formally on campuses where “non-curricular” clubs are allowed (i.e., the school has a “limited open forum” policy). Wherever there is a “closed forum” policy, they can only meet unofficially. Get more info as well as campus club resources. Regardless of what action students may take after See You at the Pole™, encourage and challenge them to make a personal commitment with other students to pray regularly. Visit National Network of Youth Ministries for current information on how to begin an ongoing network of youth workers. Or call them at (858) 451-1111 between 8:30a and 5p (Pacific), Monday through Friday. No one can encourage students to take part in See You at the Pole™ like you—their youth pastor! The more you support and encourage students to be at their flagpole and pray, the greater participation from students, and the more prayers for the school(s) and community will be offered up to God. Encourage your students to promote See You at the Pole™ by inviting their friends. The strongest form of promotion is a personal invitation. Encourage students to invite their friends to pre-pole and post-pole events, as well as to remind them to be there the morning of See You at the Pole™. Get free publicity and clip-art for creating your own materials or excellent resources at reasonable prices. Use these banners on your youth ministry's web site, Facebook, etc. The See You at the Pole™ Promo DVD is an excellent resource to use at rallies, Bible studies, worship services, or other student gatherings. The video is professionally produced, motivating, and has a lot of options for different settings. The See You at the Pole™ Bulletin Insert/Flyer is a great way to get the word out to your entire church. Encourage your students to wear their See You at the Pole™ t-shirts on a specified day during the week of See You at the Pole and on the day of SYATP. You may purchase See You at the Pole™ resources, such as the Promo DVD, brochures, posters, banners, wristbands, and more at reasonable prices. Visit our Online Store 24-hours a day or call 817.HIS.PLAN between 9a and 5p (Central), Monday through Friday. This generation of students is boldly proclaiming the truth of Jesus Christ on their campuses, perhaps as in no other time in history. They need to see publicly that Christian adults in their community stand beside them. The Sunday before See You at the Pole™ (Campus Sunday) is an excellent time for churches to show their support for the event. Furthermore, it is a great opportunity for congregations to join together in prayer for their local campuses, educators, and students. Use videos in the service to express the passion and emotion of students involved in ministry on their campus. Invite students, youth leaders, teachers, or coaches to give real-life examples of the issues teenagers face without Christ. Let these people also share their impact as a Christian example on the school campus. Ask students to share testimonies about what God is doing at their school. Include a time of commissioning where students in the service stand or come to the front and ask a church leader to voice a prayer of dedication, spiritual protection, and intercession over the students. Use a church bulletin insert to explain and promote See You at the Pole™. Visit the Pray for Schools site for ideas to use at your church. According to Supreme Court precedent and their constitutional rights, students already have permission to have See You at the Pole™ because it is student-led, before school hours, and outside of any school building. It does not cost the district anything financially for students to meet and pray, so they aren’t “establishing religion with tax money.” Read the United States Department of Education's statement on "Religious Expression in Public Schools." Know their rights. Students who take leadership should be willing to back up their beliefs, if necessary, by studying the materials available. Visit the Alliance Defending Freedom web site for more info regarding students’ legal rights. Plan their response. If ordered by a school official to disperse during See You at the Pole™, students should respectfully leave the school grounds and pray off campus. The goal of See You at the Pole™ is to pray to God, not fight with man. They can make an appointment with the official later to discuss the situation. Use their available resources. Expert legal counsel is available from several groups offering free assistance to individuals in religious-liberty cases. Timely intervention has resolved almost every situation with little difficulty! Remember—above all, your students are representing Christ. Legal counsel for See You at the Pole™ has indicated that it is legal for any adults, including school employees, to participate in this before-school event. However, no adult is to lead out in praying. Please leave the leadership to the students. Read more about adult participation in See You at the Pole™. What is See You at the Pole™? Why meet at the flagpole in front of the school? In 1990 when youth ministers in Texas first challenged young people to meet on a common day to launch their school year in prayer, one of the concerns what how to help those who wanted to pray together find each other. It was noted that virtually every school has a flagpole, and the flagpole provided an easy-to-identify place to gather. Also, one issue that the teenagers were praying about was the spiritual health of their country and their leaders, in obedience to 1 Timothy 2:1–2. Hence, the location and name of the event! How did See You at the Pole™ start? See You at the Pole™ was inspired by the initiative of student in one youth group in Burleson, Texas, early in 1990. The teenagers felt led to go and pray at night at several area schools during a weekend youth group retreat. They had a profound time of prayer, and their experience was shared with thousands of other youth from across Texas in the form of a challenge in June 1990 at a large conference. More than 56,000 students on 1,200 campuses in Texas and three other states were documented at the first See You at the Pole™ in September of that year. The movement continued to grow nationally and internationally from 1991 on. For more information, readthe See You at the Pole™ history. Is See You at the Pole™ legal? "Students may also participate in before or after school events with religious content, such as "see you at the flag pole" gatherings, on the same terms as they may participate in other noncurriculum activities on school premises. School officials may neither discourage nor encourage participation in such an event." It should be noted that among the legal groups which affirmed the legality of See You at the Pole™ by drafting the USDOE guidelines were the Christian Legal Society, American Civil Liberties Union, the Anti-Defamation League, National Council of Churches, National Association of Evangelicals, and People for the American Way, as well as six others. For a complete list of the Drafting Committee and Endorsing Organizations, contact the National Network of Youth Ministries or call (858) 451-1111. If students who are praying are told by someone from the administration (or otherwise in authority at the school) to stop praying during See You at the Pole™, we recommend that you obey that authority and move your prayer time off campus. See You at the Pole™ is about praying, not arguing about your legal rights. You may want to bring a parent, youth worker, or other adult with you to speak to the authority later. If necessary, you may want to contact a legal group who can clarify your rights for the school official. Students of all ages—as young as preschool and elementary age through students on college and university campuses—have been the primary participants of See You at the Pole™. The largest groups have been at middle/junior high schools and high schools. Teachers and administrators have prayed for students at the same time in their own groups. We have had reports of adults meeting at retirement homes, military bases, corporate headquarters for multinational corporations, and elsewhere on six continents to participate in See You at the Pole™. Clearly, we believe God is honored by united prayer for people and the world He created and loves. A second part of this question is, "Who should participate on school grounds?" There are at least two aspects to the answer to this questions—bear with us! On the on hand, it is plain that God has honored the initiative of students who are concerned for their school to initiate, plan, and lead See You at the Pole™. This is all about young people, desperate for God, inviting Him to intervene and make "His kingdom come" among their friends, in their communities, and in our nation. We need to honor how God has led the movement to grow. The laws of the land also protect the legal rights of students to express their faith without adult control. While concerned adults should support students by praying for them, we recommend that they do not actively participate, and especially not lead, See You at the Pole™ gatherings on school grounds. Can parents, and/or adults, participate in events such as See You at the Pole™? Yes, with reservations. Schools have policies concerning visitors on campus. As long as those policies are not discriminatory against religious people they should be complied with. For example, most school officials require that visitors check in before they enter the campus. Even though See You at the Pole™ is before school and usually outside, it is important for adults, even parents, to follow the policies set up by school officials. School officials have a legitimate interest in knowing who is on their campus at any given time. Because of the early hour of See You at the Pole™, it may be necessary for you to notify school officials the day before. If school officials permit visitors they should also permit you to enter the campus and participate in See You at the Pole™. Can teachers and administrators participate in events such as See You at the Pole™? This is perhaps the most complicated of all the issues we have dealt with. In Tinker v. Des Moines Independent Community School District, the Supreme Court of the United States has held that teachers do not shed their constitutional rights when they enter the schoolhouse gate. Since that time, however, courts have been reluctant if not resistant to state what rights teachers have on campus. The problem is on e of endorsement. Teachers are authority figures on their school campuses. They have specific official responsibilities; because of those responsibilities, students often view teachers as agents of the state. What this means is that students view teachers as government officials. Therefore, when a teacher participates in events such as See You at the Pole™, it is possible for student to confuse a teacher or administrator's personal speech with their official speech. In order to determine if a teacher has a right to participate in events such as See You at the Pole™ then, we must evaluate several areas. At what time of day is the event occurring? If it is during what is known as "noncontract time," it is possible that the teacher could participate without violating the constitution. What role is the teacher or administrator attempting to take in the event? If the teacher is merely showing up to observe the event, it could be constitutional. On the other hand, if the teacher is leading the prayer, or participating in the prayer, it could violate the constitution. If you need more information or have further questions about legal issues related to participating on campus, contact The American Center for Law and Justice or one of these other public law interest groups. Who sponsors See You at the Pole™? There is no sponsor for See You at the Pole™. The students at each school initiate and lead this event. A student-led Christian club, Equal Access club, or other recognized organization on campus may choose to make See You at the Pole™ an "official activity" of their club. At the same time, it is important for concerned adults to support and encourage the student leaders of See You at the Pole™. Many have stepped up to do so. A diverse mix of approximately 100 church denominations, nonprofit ministries, and other organizations are listed as "Supporting Ministries" who promote, endorse, or otherwise support See You at the Pole™. 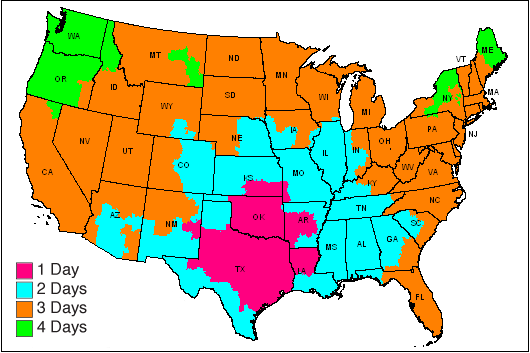 Among these groups, the Baptist General Convention of Texas, with headquarters in Dallas, Texas. owns the trademark for the See You at the Pole™ name and event. Student Discipleship Ministries in Burleson, Texas, creates and distributes the promotional materials, videos, etc. The San Diego-based National Network of Youth Ministries coordinates the promotion and media relations. What do we do at See You at the Pole™? In keeping with the student-led nature of See You at the Pole™, it is important for students to prayerfully plan how they will use the time during their See You at the Pole™ gathering. In fact, the event itself was born in a time of prayer by one youth group that dared to follow God's leading to pray for their schools. Many gatherings have included student-led worship, Bible reading, prayer in large ad small groups, and even a message by a student leader. Most have placed a high value on participation by those attending. Some have decided that 7 a.m. on the fourth Wednesday in September did not work best for them—Australian youth meet in May, which is the beginning of their fall term, and others choose a more convenient time, according to what works best for them. Whenever you meet, be sure to let others know! What do we do if our school is closed on the day of See You at the Pole™? If for some reason your campus is closed on the fourth Wednesday in September, you might decide to gather anyway. But students have scheduled their See You at the Pole™ gatherings the day before or after most U.S. students meet to pray. Some groups have rescheduled a week—or even a month—later because of hurricanes! How do we publicize See You at the Pole™? Most groups leading See You at the Pole™ on their campus invite others by word of mouth, through their church youth groups, or by creating simple flyers to give other students with details of the event on them. Some groups have been more aggressive about informing newspapers, secular or religious radio stations, and community churches about the event. See a sample Media Alert. The amount of publicity that your group is permitted to do on campus may be limited by your group's status as a club and the permission of the administration. For example, the federal Equal Access Act requires that all sanctioned clubs receive equal access to hang posters, make announcements, or use other means to publicize their events. If See You at the Pole™ is an official activity of a sanctioned club, for example, you should therefore be allowed to publicize it in the same way as a ski club could promote a ski trip or club meeting. If See You at the Pole™ is being organized "informally" by students who just want to pray, however, the administration may limit your access to word of mouth or off-campus promotion. See You at the Pole™ artwork and logos can be downloaded from "Stuff for Free" section of store on this web site as materials become available. This material is copyrighted but may be used for noncommercial publicity if not for sale and if it is not altered except for size. If you have questions about your use of this material, please contact Henry Brown in the See You at the Pole™ Resource Office in Texas at (817) 447-6900.
Who does the media contact to have questions answered? Please note that there is quite a bit of information posted in the Press section of See You at the Pole™ web site, including a Media Alert and high-resolution photos and stories from last year's event. Whether you are writing for a school paper of daily newspaper, please contact Doug Clark via email at dclark (at) youthworkers.net (or by calling (858) 451-1111). He would be glad to assist you in finding local contacts, those who may have participated before or are planning to be involved this year, and other information. Radio stations can also get Public Service Announcements via download or by faxing a request on station letterhead to (817) 447-2309. Doug can also assist you by providing on-air interviews or finding contacts in your community to do so. We don't want this to end! What do we do after See You at the Pole™? Many students feel the same way. Reports come to us of the delight in discovering "there are many at my school who love God the way I do!" This has prompted them to initiate prayer times for their campus every day, weekly, monthly, and on other special occasions such as the National Day of Prayer (the first Thursday in May). Young people have started Christian clubs, Bible studies, or found other ways to function as the body of Christ at their school. If you are interested in exploring additional steps, resources are available from your church, denomination, ministry or by visiting the Campus Alliance. We encourage you to turn in a report about your See You at the Pole™ gathering via the Internet. These stories may be shared with others in one of our See You at the Pole™ National Reports after the event, as well as other publications. We also appreciate receiving pictures and video of your gathering. How can my church support See You at the Pole™ and our students? Churches throughout the nation are seeking to support Christian students as they step up up to be leaders at their schools. There are a number of prayer strategies churches are using to support teenagers. Many churches set aside the weekend before See You at the Pole™ to identify and pray for Christian teachers and students in their worship services. Some call this "Campus Challenge Sunday." Resources, including a "Challenge Sunday Tool Kit," are available from the Campus Alliance. Many adults have "prayed ahead" by participating in Campus Prayer Journeys, meeting to walk and pray at "every elementary, secondary, and collegiate campus in the United States and Canada" on the night before See You at the Pole™. You can go on "prayer drives" in your city, praying for schools as you drive past them. Alternatively, you can pray for schools as you drive past them during your daily routine. Is See You at the Pole™ biblical? Didn't Jesus condemn public prayer? There is nothing more important to the people and ministries supporting See You at the Pole™ than to be obedient to God's will and consistent with the teachings of the Bible. "And when thou prayest, thou shalt not be as the hypocrites are: for they love to pray standing in the synagogues and in the corners of the streets, that they may be seen of men. Verily I say unto you, They have their reward. But thou, when thou prayest, enter into thy closet, and when thou hast shut thy door, pray to thy Father which is in secret; and thy Father which seeth in secret shall reward thee openly." Some have said of this passage, "Jesus is saying here that prayer should be a private matter between God and the one praying." We would respectfully disagree that this is the concern of what Jesus is teaching in Matthew 6. The young girl "got it"! Her testimony was that she was praying to meet with God, not "to be seen of men." And yet her prayer was public. It should be pointed out that any public prayer runs the risk of being "for show" or a "display of righteousness" that falls within the condemnation of Jesus in the Sermon on the Mount. Jesus Himself prayed in public. So did the Apostle Paul and others. Any student of God's Word could cite specific references. A careful review of the Scripture would not lead one to the conlcusion that public prayer in and of itself is unbiblical. Would anyone condemn Rick Warren for leading prayer at the inauguration of a president? Or the chaplain of the Senate for opening a session in prayer, even though it may be broadcast on C-SPAN? In the words and context of what Jesus said, does it not seem clear that he is condemning an attitude of the HEART, not prayer in public as a whole? We would be the first to echo that condemnation. We don't believe God would be at all pleased if someone prayed with a proud heart. We encourage all those who participate in See You at the Pole™ to do so in the humility that comes from wisdom (James 3:13b). We also believe God does not want See You at the Pole™ to end with a one-day event, but to be used as a springboard for students to unite together to bless and pray for their school. For more information, please read the answer above to "We don't want this to end! What can we do after See You at the Pole™?" What are the verses and themes from past See You at the Pole™ gatherings? 2008—Speak for Your Servant is Listening! All verses NIV unless noted. *New Living Translation. #New American Standard Bible. †Contemporary English Version. %King James Version ‡New Living Translation.